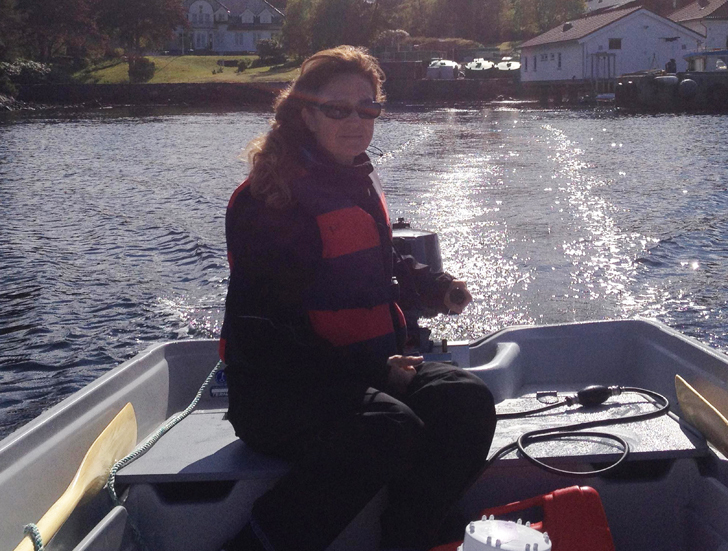 Skidaway Institute volunteer scientist Nancy Tenenbaum recently travelled to Norway, to work with fellow Skidaway scientist Dr. Stella Berger. She described her experience in the form of a letter to her mentor, retired Savannah business leader and Skidaway Institute supporter, Howard Morrison. Having had a few days to settle in here and wishing I could have packed you in my suitcase as well. I am going to let you share the day with me through this letter. 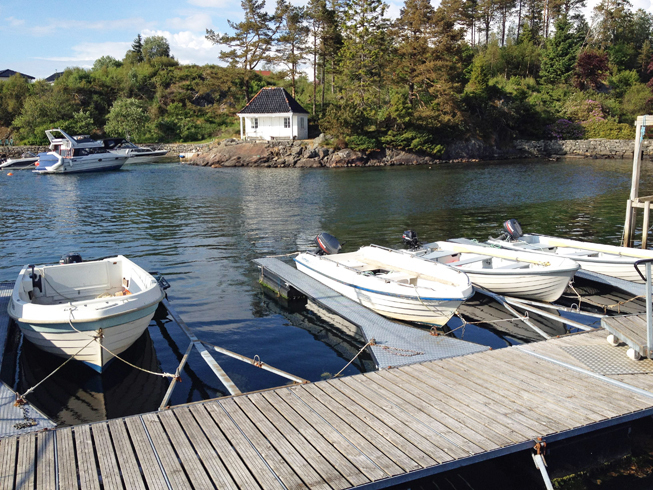 I am in Espegrend, Norway, with a phytoplankton research project called Phytostress. The word “stress” takes on a new meaning with this project. There are only a hand full of students and professors here to manage twelve mesocosms and three experiments. In the course of the next two weeks I know I will need your encouragement and advise. So, let the day begin. Taped to the window in my dorm room is a thick, black garbage bag to keep out the midnight sun. Light at any hour after 10 pm is your worst enemy! Block it out at all costs. You might find it a bit challenging to navigate in my tiny dorm room. Most certainly it is not the spacious Civil War home, Lebanon Plantation, that you reside in. Through an open window in the kitchen field station birds sing incessantly. Fresh coffee waits patiently for the early riser made by Maria Segovia, the principal investigator of Phytostress. Norway has no version of half and half cream. Flotte,, heavy cream., is it. Putting a small amount in my coffee cup I think about the potential threat for artery clogging. Will I survive the day? On the wooden counter top a Norwegian breakfast of various cheese, lox, fruit muesli and a hardy multi-seed rye bread await. View from the field station kitchen window. You will need a jacket this morning as it is cool, about 11 degrees C (52 degrees F). The fiord water sparkles in the sunlight. On the hillside edelweiss, purple clover and yellow buttercups dance with the morning breeze. Compared to the weather when I was here in March, this is heaven. Under the global change scenario around 40-50% of the CO2 emitted by anthropogenic activities is accumulated in the oceans causing acidification and increasing the availability of dissolved CO2 to primary producers (phytoplankton, algae, etc.). To understand the regulation of the carbon cycle it is basic to determine the interaction of the main factors controlling primary production in the ocean. The increase of UV radiation due to ozone loss can reduce the oceanic phytoplankton CO2 sinking capacity up to 2%. Concomitantly, the scarcity of micronutrients, such as iron, can affect the composition, functioning and growth of phytoplankton. However, although up to date there are several studies about the effect of UV on iron ocean speciation, there is none about the interaction between CO2, Fe (iron) and UV in phytoplankton, and the underlying mechanisms has not been elucidated yet. Equally, there is evidence of massive cell death phenomena in phytoplankton communities that can account for a great loss of biomass amount, altering diversity and hence affecting the carbon cycle. The proposed experiments, will lead us to a better understanding about the functions of marine phytoplankton as well as to determine how changes in CO2, UV and Fe availability control the fate of primary production in the ocean, regarding biomass and diversity loss. 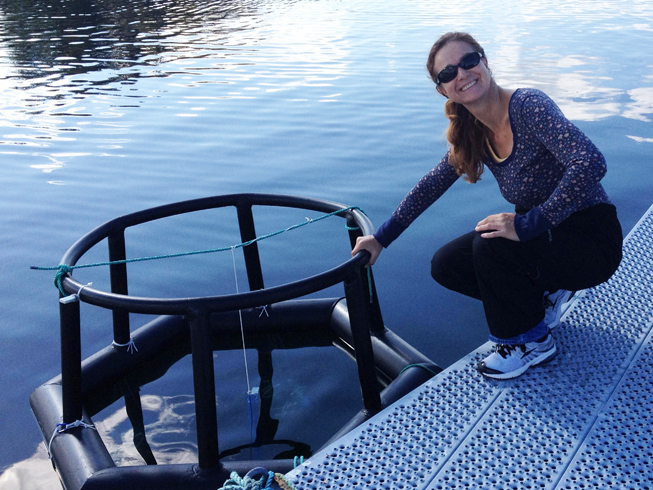 In an introductory email before the research in May, Maria wrote that this mesocosm project is a dream come true for her. Howard, we are now at the dock. I know how much you love to ride in boats. Even though the ride to the raft will be quick it could be chilly. 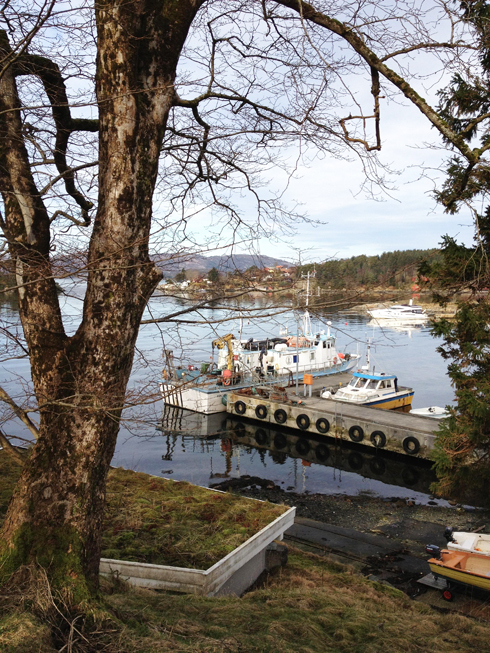 The swans that graced the fjord in March are gone. Truthfully they were noisy, mean and not very white, like their counterparts in fairy tales. Scientists and Ph.D. students, who are scheduled to sample water today, gather at the dock with sixteen, 25-liter carboys. Clothed in Healy Hansen immersion suits or only a life jacket they board small motorboats for the mesocosms. You are now at the mesocosm raft. Be careful on exiting the boat as the concrete raft moves with the current making its surface slippery. 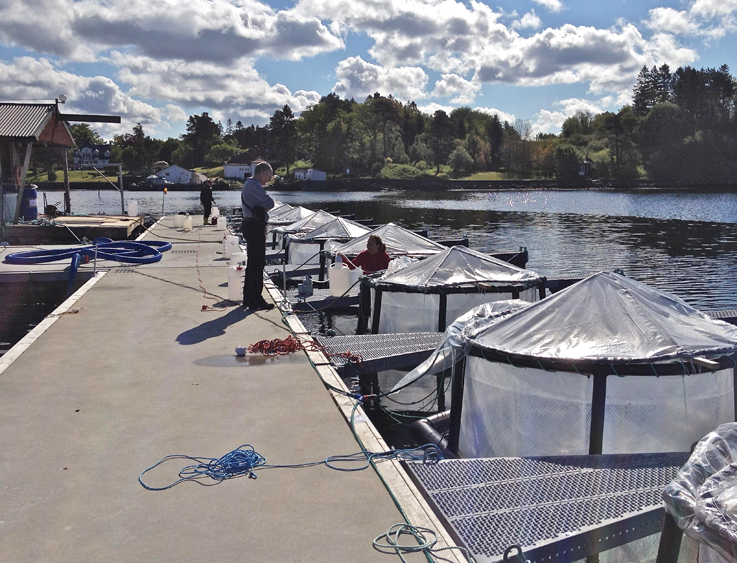 There are twelve covered mesocosms that are tethered to this raft. A decoy hawk is mounted on a pole to scare off birds. It does absolutely no good! Birds actually seem attracted to it. Water is sampled by pumping H2O though a plastic meticulously washed tube into carboys. Full carboys of 25 liters are then loaded onto the boats, delivered to land and hauled up a hill using a flat wagon and human strength. 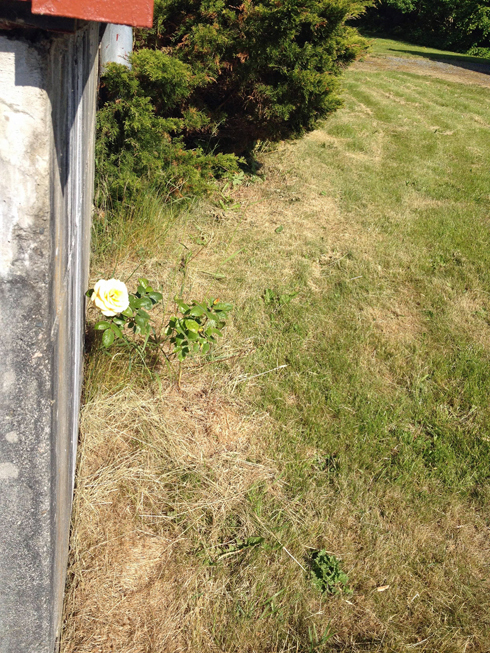 We are about to enter the lab when I spy a single wild yellow rose in full bloom. Immediately I am reminded of Antoine de Saint-Euprey’s story, The Little Prince. In this children’s book the rose is essential to the novel’s drama. Carefully tended by the prince, she is his motivation for leaving and returning to his planet. The rose in this book represents love, an invisible but essential emotion. If no passion exists to nourish life then the question presented is: can life survive? My passion extends to the invisible life of phytoplankton. They are in fact the unseen art forms. Simple, yet complex their balance in the food web is essential for life. Armed with those words, I will take you into the lab hoping to have a productive day. Actually the lab rooms are right out of Dr. Seuss! Wacky and wonderful the equipment is dormant waiting for creative direction. Machines hum and filtering systems wait expectantly. 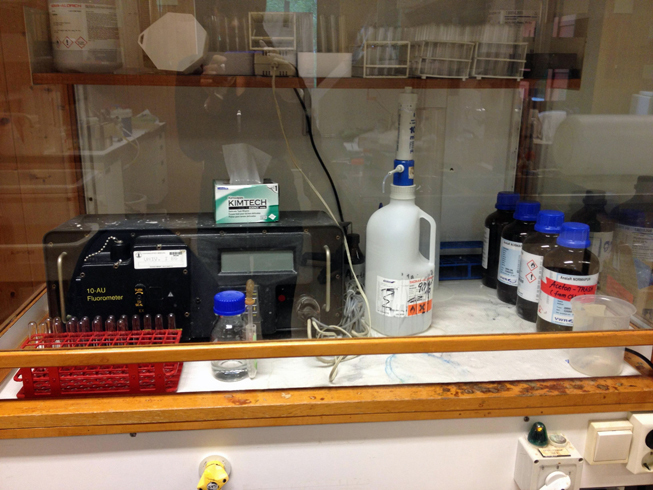 Life in the lab is a clandestine life unto itself. We will need to double glove for this next task. An elaborate washing protocol is the first order of duty. Each sampling bottle must be washed with Deacon water, then immersed and soaked in HCl and finally rinsed five times with Milliq. H2O. As this involves a Fe (Iron) limitation experiment it becomes imperative to remove all possible traces of containment iron. This is a very time consuming process. Dr. Stella Berger and I are on the microzooplankton team. Microzooplankton can be defined as greater that 0.2-20 micrometers in size, which includes ciliates, dinoflagellates and diatoms. She is also working on a dilution experiment that she designed. 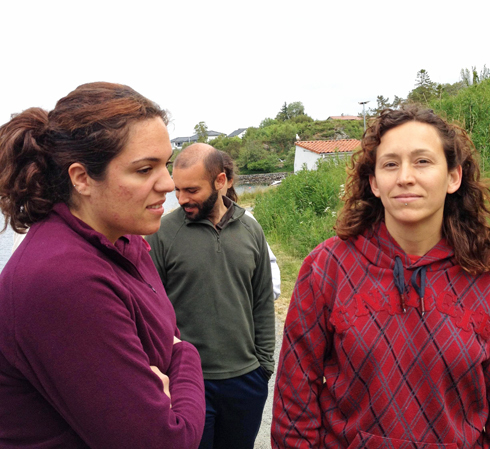 We return to the boat with Dr. Jose Fernandez from Malaga, to sample mesocosms numbers 1-6 and the fjord. Our samples are brought to our cold room. Part of every sample is then labeled and stored in covered boxes. Some are viewed as live slides in the inverted microscope. This is my favorite part of the day. Seeing the phytoplankton move and interact is just amazing. When I was here in March, I had the rare opportunity to meet and work with Andrei Sazchin. Dr. Sazchin is a Russian phytoplankton taxonomist. Stella begins running her samples through a Flow Cam. Every cell is photographed and organized into libraries for later study. 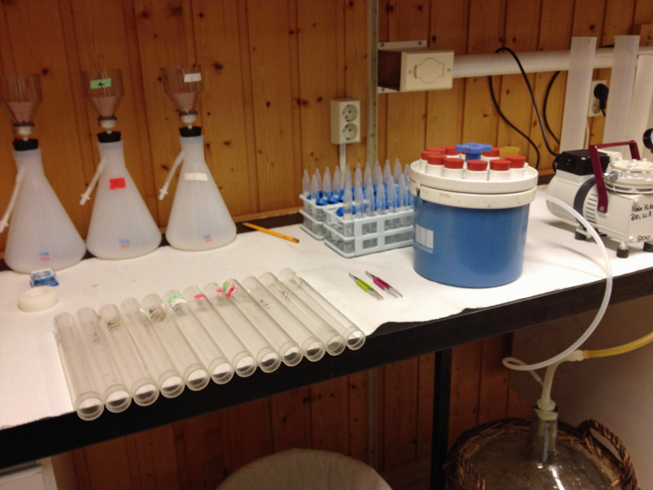 Each mesocosm sample involves a thirty-minute run process. I have a brief SKYPE conversation with my mentor and close friend, Sandra Nierzwicki-Bauer, Director of the Darrin Fresh Water Institute at Bolton Landing, Lake George, New York. It does fact take a village of mentors to maintain the privilege of representing Skidaway Institute as a citizen scientist. Dr. Marc Frischer and Dr. Stella Berger are also instrumental in guiding me on scientific path. Lunch. I am the only American here. The Spanish lunch have a late, protracted lunch experience. This long, heavy lunch is followed by lengthy scientific discussions in Spanish. Hope you are ready for a quick refreshing walk. 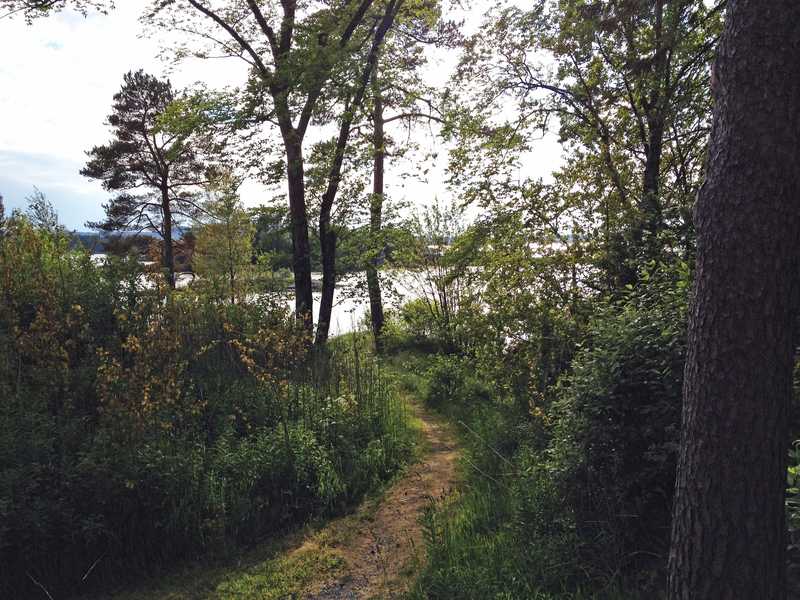 The path by the fjord is a perfect place to reflect and regenerate. Bergen is a dichotomy. Look beneath the perfect postcard landscape and you will discover an ugly history of Nazi infiltration, which happened during WWII. On the hillside adjoining the field station is the “castle.” A Nazi once owned and lived in this forbidding residence. Inside, according to the locals, are memorabilia including swastikas that cover the walls. Just looking upon it reminds me that six million Jews died as a result of Hitler. Turning back to the water we are accosted by the smell of wild roses and rhododendron. Seagulls cry. The sound of the water is soothing as it covers rocks and sand on a small beach. 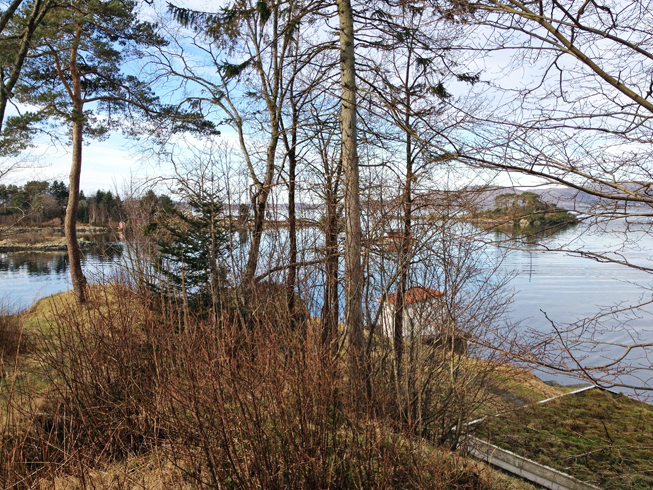 Tiny islands with houses dot the fjord. You can feel the ancient pulse of the land. It emanates from the soil. Life despite its brief encounter with chaos and death has moved forward in a beautiful, peaceful way. Back in the lab we are ready to take the sample water for chlorophyll a (Chl a) is filtering in duplicate. The lights are turned off and sunlight blocked by a makeshift shade as it excites the chlorophyll. A reading skewed by light will not be accurate. Once the water is filtered, the filter is put in a falcon tube, extracted with 90% acetone and then put in a covered box in a refrigerator where they stored for 6-24 hours. The next day samples are measured by a fluorometer. This device measures parameters of fluorescence determining the amount of Chl a in the sample. We are back at a hood with an exhaust fan. After we have double gloved, each bottle will be immersed in hydrochloric acid for two hours. At some point every day it is good protocol update a lab notebook with general thoughts and data for the day. 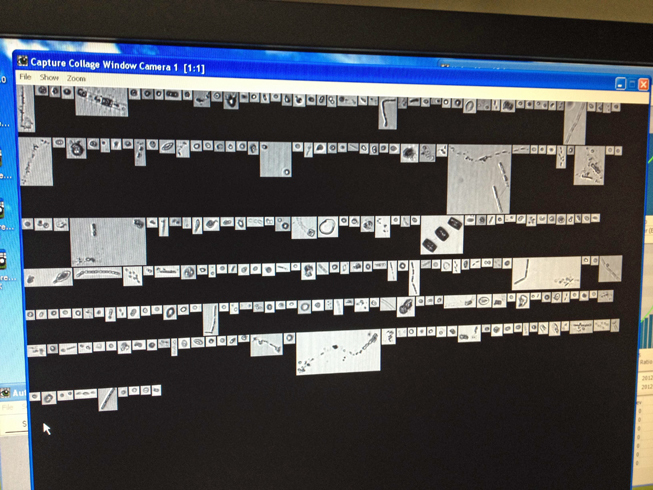 Stella has just finished running the last sample in the Flow Cam. Slides from the inverted microscope used during the day are carefully washed. Dr. Jose’ Fernandez, Armando Olmo and I are on cooking duty tonight for 16 hungry people. You can pour the wine Howard to keep us happy while we cook. Tonight we will prepare paella. a traditional Spanish dish. This is a secret recipe of Jose’s grandmother. I am chopping vegetables and hoping to learn the recipe for this famous meal. What I did manage to get from Jose’ is that the rice must absorb the flavors of the meat and vegetables. Timing apparently is everything. So thanks to Jose the paella was delicious and a great success. The scientist and students sit down for dinner at a long narrow wooden table which seats at least 25. Most of the conversation is in Spanish. Some students go back to the lab after dinner to finish up. 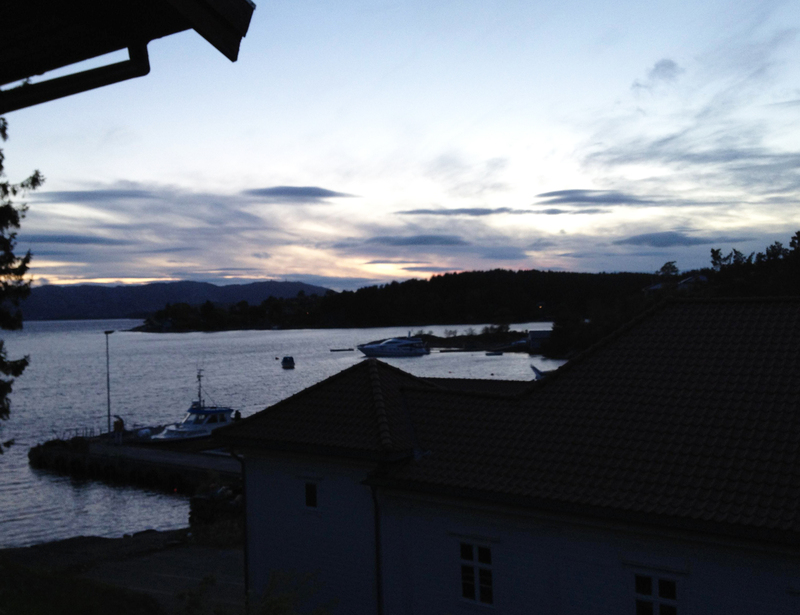 Howard, there is something about the Norwegian blue hour that is pure magic. The blue hour, not quite at sunset, floods the landscape with a purplish blue hue. Maria’s two children are still running around with abundant energy. Laughing, and singing they are so undeterred by the hour. I on the other hand am jet lagged and exhausted. From my room I hear Maria’s husband calling his son Rodrigo to come inside. 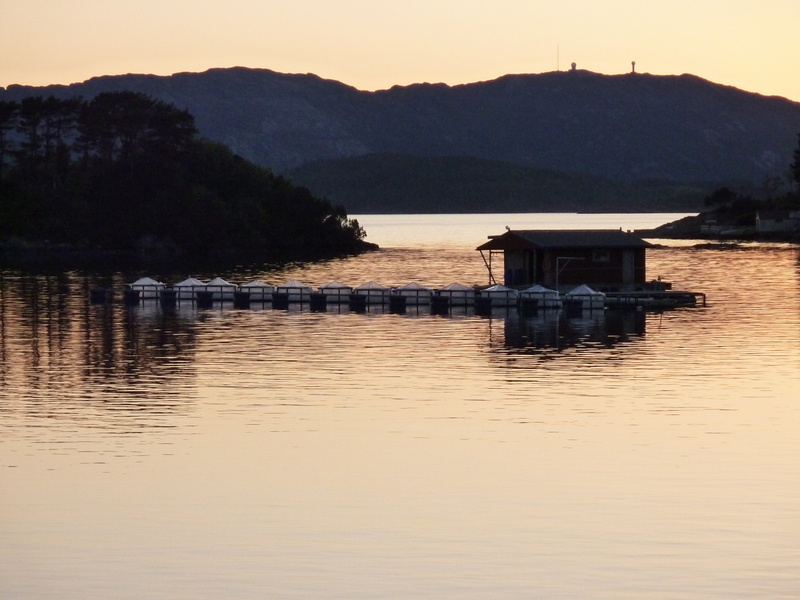 Sunset at the mesocosm raft. Photo by Maria Segovia. Thanks for sharing the day with me! Good night from the land of the midnight sun. 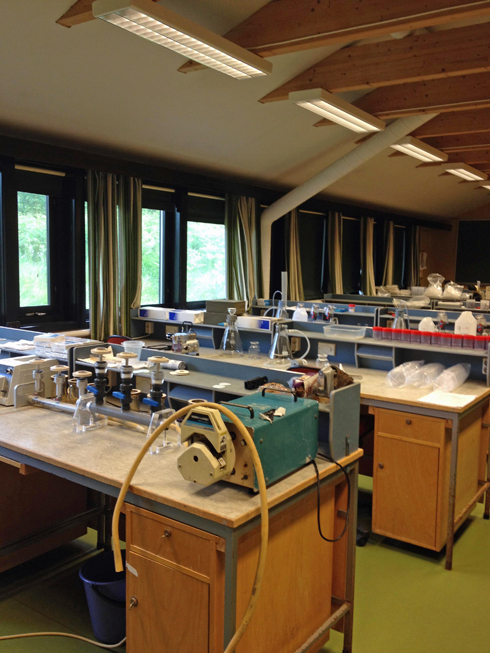 Skidaway Institute scientist Aron Stubbins has spent the last couple of months working in Germany. He reports in on a cruise he is about to join. I’m off to the Arctic on Germany research vessel Polarstern. I will be collecting samples to determine the export of dissolved black carbon from the Arctic to the Atlantic Ocean. The cruise will transect Fram Strait, the major gateway for the exchange of water and dissolved material between the two ocean basins. Today we will leave Bremerhaven in Germany, site of the Alfred Wegener Institute which houses the R/V Polarstern. In a few days we will reach Svalbard and begin a transect from there towards Greenland following 78.5 degrees north. During this transect we will first cross the West Spitsbergen Current (WSC) which carries warm Atlantic waters north into the Arctic Ocean. This is the northernmost extent of the Gulf Stream that originates in the Gulf of Mexico and travels past Georgia and Savannah at the edge of the Georgia shelf. We will then transit west towards Greenland, breaking ice as we go. In this part of the cruise we will collect water samples from the East Greenland Current (EGC). This carries cold, polar water south into the Atlantic Ocean. A figure of the currents is shown at http://www.whoi.edu/science/PO/people/pwinsor/project_ao02.html. My work will look at the amount and type of dissolved organic carbon that these two massive currents carry north (WSC) and south (EGC). Our progress can be followed in real time at http://www.awi.de/en/infrastructure/ships/polarstern/where_is_polarstern/. This site will also post weekly updates about life and science aboard R/V Polarstern. The cruise will end in Longyearbyen on Svalbard where I will collect some samples to continue ongoing investigations into the sources and nature of glacier carbon (http://www.skio.usg.edu/?p=research/chem/biogeochem/glaciers). Skidaway Institute of Oceanography scientists Jens Nejstgaard and Stella Berger are part of a 21-member, international team of researchers whose paper was recently published in the Journal of Experimental Marine Biology and Ecology. The object of the research was to observe the effects of different light levels on the behavior of microscopic marine organisms. The team focused their efforts at a group of organisms called mixotrophs. Those are single-cell plankton that exhibit the characteristics of both animals (heterotrophs) and plants (autotrophs). They feed on other organisms, but they also can grow through photosynthesis, just like algae and other plants. The international team with Stella Berger (back row, center, with sunglasses) and Jens Nejstgaard (far right) conducting experiment with specially designed mesocosms, using neural (grey) optical films to simulate light levels on different depth’s down to 50 m in the Eastern Mediterranean. 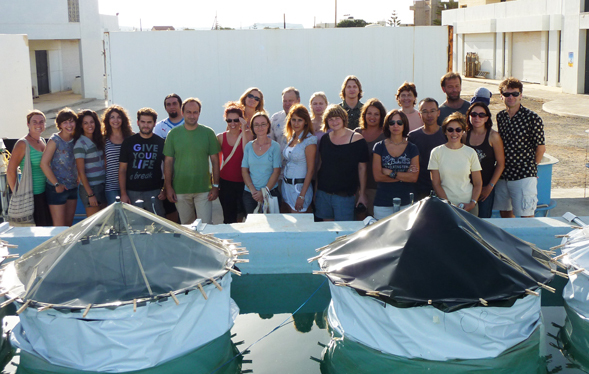 Nejstgaard, Berger and their colleagues, collected natural water containing plankton and other organisms from the Eastern Mediterranean Sea near Crete and transported it to a into specially-designed tanks on land, called mesocosms, at the Hellenic Centre for Marine Research. In the 30-cubic-feet mesocosms they adjusted light levels to simulate differences in ocean depths down to approximately 150 feet. The researchers found the mixotrophs do react to different levels of light. In general, the organisms tended towards plant behavior in brighter light and animal behavior at lower light levels. However, they also found that response is very complex, and the entire team of scientists that worked on the mesocosms are presently analyzing a large amount of data to clarify many of the ecosystem interactions in this complex system. 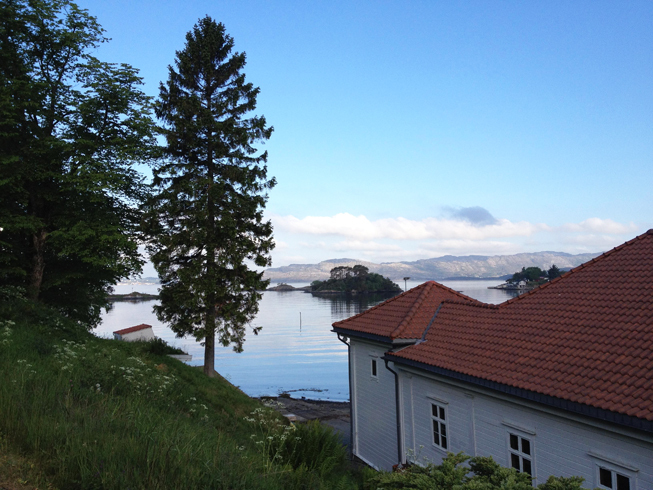 Skidaway Institute scientist Stella Berger is spending time in Norway, as part of an interesting project involving an international team of researchers. They are looking at the relationship among carbon dioxide, iron and ultra violet radiation as they relate to the production of phytoplankton in the ocean. You can read more about it at the team’s blog http://phytostress.wordpress.com/.